This page is a translation from the swedish "Hot Rod Magazine". It was published 1984. The article was in two parts. The first described the story about Smokey Yunick and what he had done in the past. 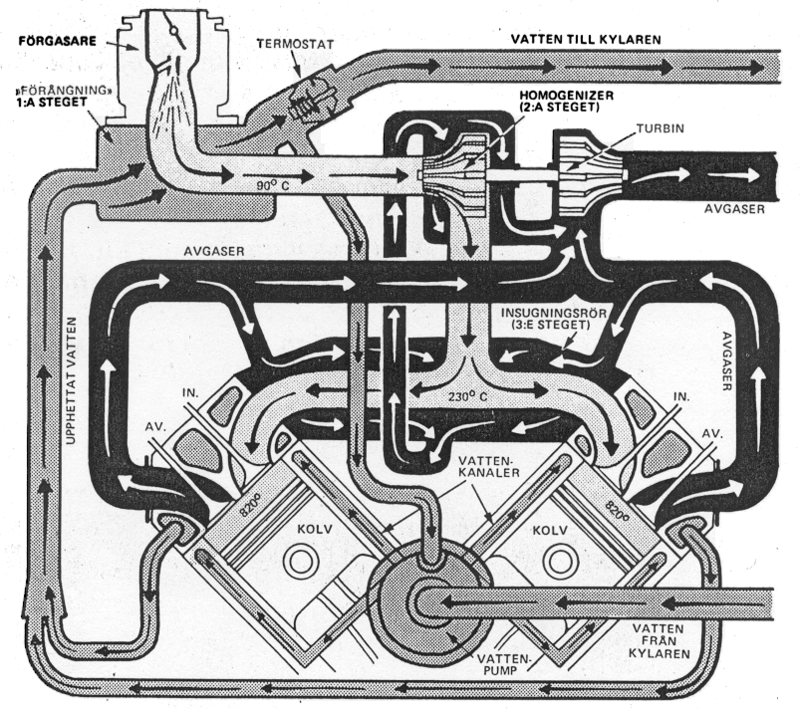 The second article described the Hot Vapor Cycle Engine. The author of the article was Anders "Bostic" Envall and the photographer was Anders Albinsson. The translation from Swedish to English was made by Hans Schou in april 2002. Henry (Harry, Gregory) "Smokey" Yunick was born on May 25, 1923 in the Maryville area, Tennessee. Died in May 2001. I worked on my motorcycle and I was racing on a half-mile track. I didn't do a very good job as it was smoking like a SOB. The guy had forgotten my name, so when I got to doing pretty good he started calling me 'Smokey'. One of the guys I worked with was there when he called me Smokey. When I got to work the next day, he kept calling me Smokey. Before you knew it everybody was calling me that. The nickname stuck. Mr. Unick built a small v-twin four cycle engine that was conventional except for the addition ot three devices that were known, understood and unpatentable. At the time he was trying to patent the new technique of using these three devices together and only described two of them in the article for the sake of security. I asked Smokey about the adiabatic engine that we all know about and he replied, "The adiabatic engine is parked, 'cept the U S Army looked at it in April '98. I doubt much will come out of those meetings." Adiabatic Of, relating to, or denoting a reversible thermodynamic process executed at constant entropy and occurring without gain or loss of heat. Reference: Yunick Adiabatic Engine. Smokey Yunick has invented an adiabatic engine. It was mentioned in the 2000-11 issue of Popular Science ("FYI", page 89). We have heard about, but not yet confirmed a mention in the 1983-04 issue of Popular Science as well. Did you happen to hear about "Smokey" Henry Yunick's adiabatic engine? He holds several patents related to the article I saw in the April 1983 issue of Popular Science. He managed to get 150 Hp and 60 MPG out of a 78 ci. 2 cyl motor. The article even goes on to say that one of the "detroit boys" were donating a car (chassis) to him for testing. Of course you've never heard about this since. Check out patent #4,862,859 and his related patents. ...discovered that one of the main components was Smokey's "homogenizer." Actually, it is a low-pressure turbocharger installed in the intake manifold just after the carburetor. In essence, the "homogenizer" is one of the components in his design of an adiabatic engine. Although it may have been able to pass the emissions tests in its day (1983), it probably could not do so today. I met Smokey Yunick at a seminar at Charlotte Motor Speedway in 88 or so and asked him about this project; the engine he used was a Mopar 2.2, and the engine had one fundamental problem- he said that there was no oil that would last for a satisfactory length of time in operation except for mil-spec jet engine oil, which he said was $98 a quart at the time. I haven't heard anything about this project since then. The legendaric Smokey Yunick is not just a world champ in cheeting He is also genious. The best prove so far is called the "Hot Vapor". A new engine which will revolutionize the hole automotive industry. Smokey's self constructed 2 cylinder engine gives the double horsepower as a standard 4 cylinder engine of the same size. Furthermore it uses much less fuel and exhaust much less pollution. Hot Vapor is almost too good to be true. But an enthusiastic Bostic is convinced. It is true! Img2: ...here is all the cooling water guided through to heat up the fuel mixture at the same time as the water looses its heat... Smokey Yunick is in a consisting adiabetic period. Some levels above all other people as usual. Img3: The fine thing about the Hot Vapor engine is that is a conventional construction. We find normal components even that the most of them has been updated for extreme strain. The idea is that one should be able to convert any standard engine to Hot Vapor! But Smokey mostly like the 2 cylindered, which is a modified Buick V6. Think about this: Your friend has a hot Golf GTI. Ou-ou. 110 horses 4 cylinder. 0-100 km/t in 10 seconds and a fuel usage in about 14.29 km/l at the high way. Your friend is happy. You have also a Golf. A 2 cylinder with 150 horses! 0-100 in 9 seconds. Fuel consumption? Yes, unbeliveable 25.64 km/l. Mixed driving!! You are more happy than your friend. No, no, no! Welcome to the future. Today! After 32 years of work the project is ready. Smokeys lifetime achievements. World premier. World patent. Hot Vapor Cycle Engine. A new engine... Prototypes has been running in 18 months in different cars including "your" Golf. The result is amazing. What to say about this equation? As Smokey is the father of the Hot Vapor engine, we have to make one thing clear: The engine is not constructed with racing in mind. Not yet as Smokey says which implies that we should not be chocked the day the hat and boots shows up at Indy 500 with a tuned Hot Vapor.... V2? V4? V6? No, this can result in more significant changes than the result list at Indy. This can result in a change in the whole automotive industry in the world. Will we go to move around in cars, trucks, MCs, boats etc. powered by Smokey Yunicks patent in the future? This is the idea behind it all. If we should start on a soft track and try to describe how this new engine works. Not easy, kept in mind that only two persons knows about it. Smokey and his right hand, of swedish roots, Ralph Johnson is reserved for the important details until they really got the world patent. Such things take time. The theory has actually been known for long by engineers all over the world and we should keep in mind that thousands of engineers have tried to build this engine. All have failed. Besides Smokey. He actually calls the project "Phase 1 adiabatic engine". "Adiabatic" or "adiabetisk" [swedish], is a technical term which describes the process where there is neither a gain or loss of heat. A full adiabatic engine is not possible but the more heat which can be used during the process the more effective the engine becomes. In all aspects. Most of today's engines uses only 25% of the potential heat energy in fuel. The other 75% is just lost in exhaust, cooling etc. This is just what have annoyed Smokey and all other engineers. To be able to use more heat energy has been the target. Heat is the keyword. The engine construction is traditional. We find a engine block, crankshaft, conrods, pistons, cylinder head, camshaft, inlet, exhaust, etc. The good old components are here, despite fitted for the Hot Vapor. The fact is that one should be able to convert a normal engine to this Hot Vapor version. Besides building a 1-, 2- and 3-cylinder himself, Smokey has successfully converted existing 4-cylinder engines. See table. Plymouth Horizon, 4-cyl 10.00 km/l 14.5 sec. Plymouth Horizon, Hot Vapor. 23.26 km/l 6.5 sec. Pontiac Fiero, 4-cyl 9.35 km/l 14.2 sec. Pontiac Fiero, Hot Vapor 21.74 km/l 5.9 sec. The thing which makes the difference between a Hot Vapor and a normal engine is by first view an advanced pipe system. It is just in this pipe system everything happens. Here happens what have given the project its name: "Hot Vapor". Here happens the heat evaporation of the fuel and air mixture. The trick! To heat up the fuel. It happens in three steps. It should not work with any fuel injection it is very important with a caburetor to give time to prepare the mixture properly. he explains. Here happens the first heating says Smokey and points at a box below the caburetor which encompasses first part of the inlet pipe. All water in the cooling system is forced through this box. All water is just 2 liter inclusive the radiator. There is no fan at all. Adiabatic... When the mixture has passed the box and is heated up to 90°C, it comes to the second step. The homogenizer says Smokey and points at an exhaust turbine wheel which is connected to an inlet turbine wheel. Aha, like a turbo, yes? I nod to the cowboy hat so he will think that I can follow him. Smart guy and so on. No! Not turbo! he says a little offended. A homogenizer it should be. The purpose of the homogenizer is to fully atomized the fuel air mixture to an extreme fine vapor. Otherwise it would be impossible to further heat up the mixture. When the mixture has passed the turbine wheel it is more heated. Partly because of the friction and partly because the homogenizer is encapsulated in the exhaust system. The mixture is now 140°C. Next step is the inlet system which is totally encapsulated in the exhaust system. Here the mixture gets heated up to 230°C! Now things starts to happen. Here it expands like hell Smokey explains and thinks that the fuel vapor expands a lot at this temperature. Exactly as we want to. Of course. Here the homogenizer has a further role: to be a back valve, to hold back the pressure which comes from the expanded fuel mixture. Without this back valve the top will be thrown to Orlando... well.. Besides the homogenizer presses with 0.45 kg. When the mixture reaches the combustion chamber more than 25% of the energy "is ready to go" (230°C). And with full compression, before ignition, the mixture has reached the extreme 820°C. After this comes the spark. You see says Smokey, what forces the piston down is not the heat, it is the pressure... Because of the heat I hopefully reply (to win back some valuable points). Thats right says Smokey and put the glasses on his hat and go sit in his chair. The boots is naturally on the table. That's about the story he says and light his pipe. There is something missing in Smokeys Hot Vapor engine. Actually the engine should destroy itself. Most people knows that too high temperature in the combustion chamber will let to detonations (uncontrolled self ignition in the combustion chamber) if not the fuel has the highest octane class. But with those figures Smokey forces up in the combustion chamber, no fuel in the world would be able to save the engine. At all. Even though it runs good on unleaded regular gas. Not a single detonation! Be welcome, you are free to guess. Because here is Smokey like a mummy. The solution to this problem is the keyword to the patent. Real secret. It is really quite simple, and I am careful not saying too much. This is the only way I can be sure nobody knows how the system exactly works says Smokey who not just get visitors from sneaking news papers. GM, Ford, Chrysler and many foreign car manufacturers comes around in "Best damn garage in town" to stress test Smokeys test cars with the new engine. It is the best engineers from the manufacturers who show up and they come several times. Smokey is laughing. They come back because they can't get the engine to spike. Some of them do everything to get the engine spiking. No one has succeeded. A technician drove about 30 km/t in highest gear and suddenly pressed the throttle. The only thing which happened was that he drove from everything that day. Some of them turn of the engine and start again and gives full throttle. Wheel spin. Others just get speed champs at the high way in hunt for spikes.